Wahoo Composites have recently constructed a new carbon fibre mast for Cheekee Monkee, the flat out racing Farrier trimaran in the US. Bloomfield Catamaran Designs (who have many years experience in carbon fibre rig design) did the design work for the new rig. Wahoo Composites specialise in high tech carbon fibre parts for many applications, including multihull rigs and boats. 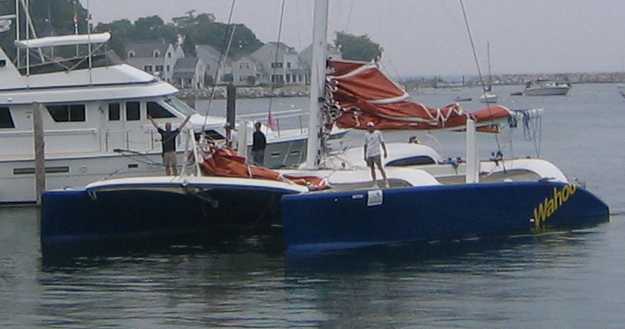 A new 26' production racing trimaran design from Bloomfield is currently under development. 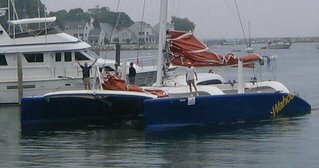 The owner's own boat 'Wahoo' a 50' racing catamaran was one of the companies first projects several years ago; video of Wahoo's successful maiden race from Port Huron to Mackinac Island can be seen here with owner Ed Wheatley and designer Stuart Bloomfield aboard.